After-work drinks, dinner with friends, or a catch up over a cup of coffee; whatever the purpose of your visit to The Bridge Lounge, you're guaranteed a warm welcome and great quality. 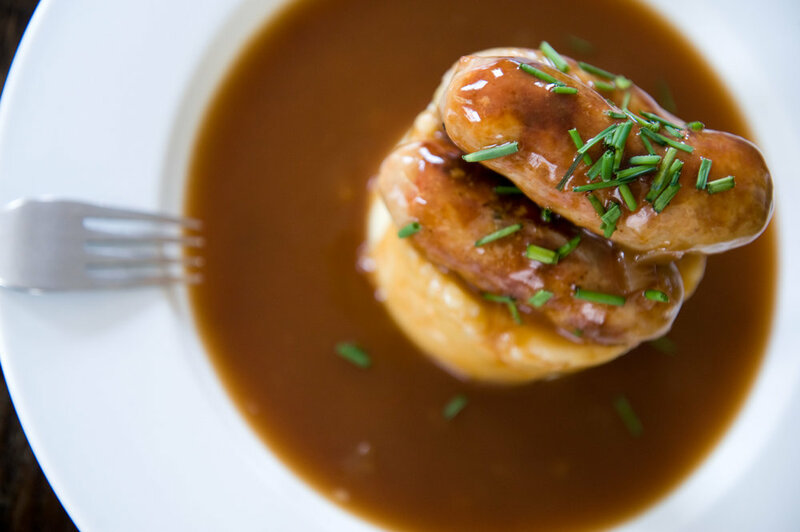 Formerly a traditional docklands-boozer serving the 'Larder of London' in the 1940's, we honour our heritage with a menu made up of classic British dishes alongside a carefully curated selection of craft beers and wines. Our ingredients are locally sourced from the likes of Borough Market, Monmouth Coffee and the Franconian Sausage Co. The upstairs bar and dining area can accommodate up to 70 people and is available for hire at no extra cost. Whether it's a corporate party or a christening, our friendly and experienced staff are on hand to help you plan the perfect event. Make an enquiry. Served with wedges or chips. Additional toppings available. Fresh beer battered haddock with chips, peas (mushy or garden) & tartar sauce. Italy, 2015, Dry, intense, floral notes & clean mineral flavour. Argentina, 2015. From the highest vineyards in the world.